Last Sunday, following up on a tip from Ed Pien, Kenny Goldsmith and I stopped by The Textile Museum of Canada to see Battleground: War Rugs from Afghanistan. 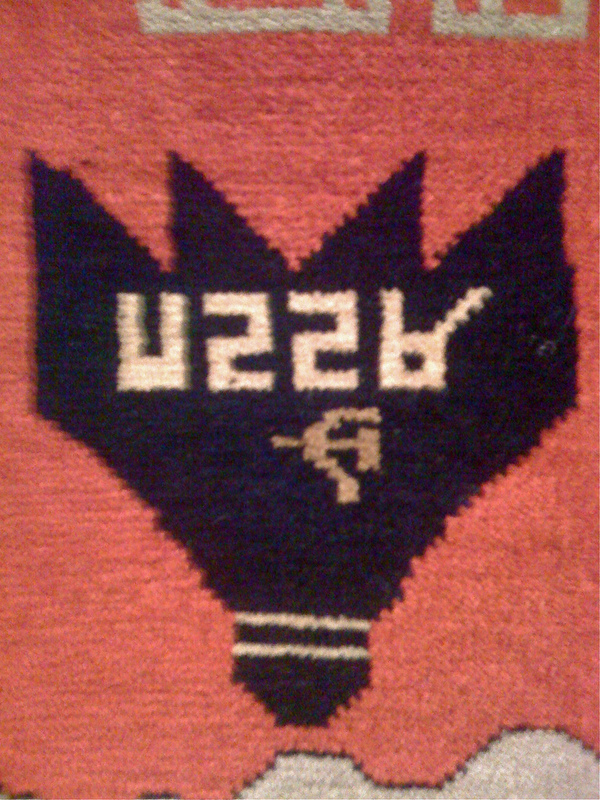 Both The Toronto Star and Now listed it as one of the best gallery shows of 2008, and it did not disappoint: curator Max Allen has assembled 118 rugs from the period of the Soviet incursion into Afghanistan (1979) up to the present. 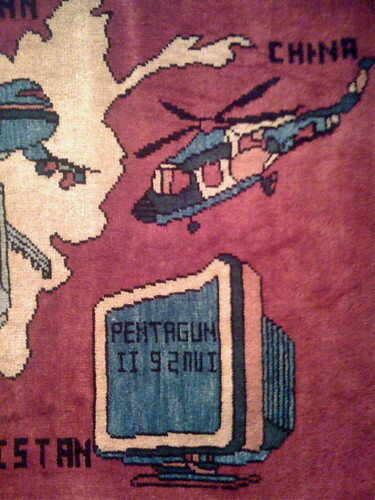 Viewing these rugs is a deeply defamiliarizing experience: woven in with traditional geometric patterns and imagery are helicopters, AK-47s, jets and fighter planes, land mines, grenades, personnel carriers, computer monitors, skyscrapers and other signs of Soviet and western culture’s violent incursions into Afghanistan. 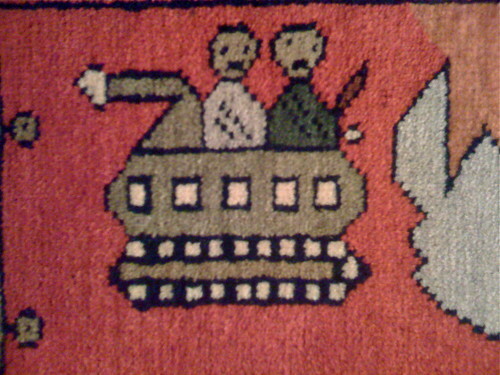 The weapons are usually rendered accurately enough that it’s possible to identify their specific models; the curator’s comments indicate that there are no fictional weapons in any of these rugs … as though that would be necessary. Having grown up in a culture where I’ve seen more video games than Afghan rugs, to my anachronistic imagination, these blocky images often look like artifacts from the 8-bit video games of my childhood. I’ve posted a Flickr set of images of these rugs, but they were taken under low lighting conditions with an iPhone camera, so I lost about half of the shots I took. The show is only up until January 27, so if you’re in Toronto, see it while you can.